The expansive opening of the CD Aftermath - Archives of Peace (42'09") by AES Dana (aka Vincent Villuis) enshrouds the listener in a primordial atmosphere. With the air resonating from sustained synthetic choir, night sounds and the cloudlike drifting tones of native flute, the aural drama sets us up for the ensuing round of head bobbing and swaying as we happily keep in time with the distended and disconnected throbs of rhythm. And so goes this album, rising strongly and falling away easily - in a new tradition of tension and release. 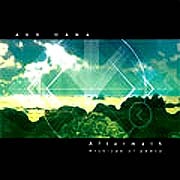 Throughout Aftermath, intelligent body beats yield to shifting synthscapes as commanding bass pulses ride beneath arpeggiated triads that twinkle on-and-off, in-and-out, like star's in the night sky and ultimately cascade back down to concentrated moments of sonic density where tonality speaks to a deeper intentionality. Loaded with arcane symbolism, intricate aural tricks and dense layers of meaning, Aftermath manages to retain a harmonic warmth and rhythmic sensibility. Unapologetically optimistic in parts, this album also leads the listener into more meditative and darker spaces as well - exploring the philosphical interplay between reality and artifice.